BCC Research recently analyzed the global market for bionic devices, assessing the latest sensor and material technologies that are being used in advanced bionic ears, eyes, hearts, limbs, and exoskeletons. These bionic components are driving market growth and changing the lives of millions of people. The global market for bionic devices was worth an estimated $3.2 billion in 2016. However, an increasing demand, driven by widening geographic access and a growing elderly population, will spur growth of this market to a predicted $6.4 billion in 2021 and $12.1 billion in 2026. That represents compound annual growth rates of 15.2% between 2016 and 2021 and 13.6% between 2021 and 2026, a period during which health spending constraints are expected to continue. Bionic ears (cochlear and middle ear implants) are expected to remain the largest product segment of the global market. Bionic hearts are the second-largest product segment. Sales of bionic eyes, limbs, and exoskeletons are much smaller, but have higher projected growth rates than either bionic ears or hearts. As a result, their cumulative market share is expected to increase from less than 10% in 2015 to nearly 20% in 2026. The United States, which held almost 40% of the global market share in 2016, is the largest geographical region for bionic devices, followed by the EU countries with nearly 34% and Japan with close to 8%. However, over the next 10 years, this distribution profile will shift. 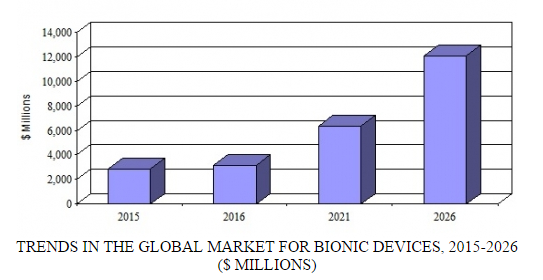 Share of the global market for bionic devices held by nonmedically advanced countries will increase to 15.5% by 2026. In the bionic device sector, innovation is at the heart of growth. For example, the intraocular electronics of Second Sight Medical Products’ Argus II bionic eye are contained in a hermetically sealed ceramic case, allowing the electronics to operate in the vitreous fluid of the eye. The impact of this type of innovation in an area of globally high unmet need will drive uptake in the sector. In 2015, the bionic eye market was estimated at $14 million, but its growth is predicted to be meteoric, at a rate of 74.4%. According to BCC Research’s forecast in Bionics: Technologies and Global Markets, this segment will be worth $723 million by 2021 and $1.5 billion by 2026. Bioengineers at Newcastle University have developed a prosthetic “hand that sees,” which is able to reach for and grasp objects automatically. This new generation of prosthesis responds 10 times faster than current prosthetics. The bionic hand is fitted with a camera that instantaneously takes a picture of the object in front of it, assesses its shape and size, and triggers a series of movements in the hand. Because it bypasses the usual processes (requiring a user to see the object, physically stimulate muscles in the arm, and trigger a movement in the prosthetic limb), the bionic hand “sees” and reacts in one fluid movement. A small number of amputees have already participated in a trial of the new technology. The Newcastle University team is working to offer the “hands with eyes” to patients at Newcastle’s Freeman Hospital. Their findings are published in Journal of Neural Engineering. The work is part of a larger project to develop a bionic hand that can sense pressure and temperature and transmit the information back to the brain. The aim is to develop novel electronic devices that connect to the forearm neural networks to allow two-way communications with the brain. The electrodes in the bionic limb would wrap around the nerve endings in the arm. For the first time, the brain would have a way to communicate directly with the prosthesis.